Dr. AnneBeth Litt, Medical Director of WIHD, was awarded the “Caring for All” award at the Westfair Communications Doctors of Distinction awards program. In addition, Michael Tarr, the founding chair of the New York Medical College (NYMC) chapter of the American Academy of Developmental Medicine and Dentistry (AADMD) was awarded the “Promise for the Future” award. 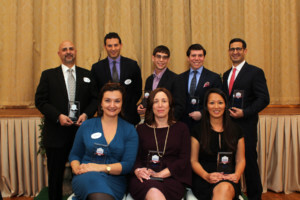 They were among a group of healthcare professionals recently honored at the October 26 event, held at the C.V Rich Mansion in White Plains. Standing, from left: Dr. Ashutosh Kaul, Greenwich Hospital; Dr. Jared Knopman, Weill Cornell Medicine NewYork-Presbyterian; Michael Tarr, New York Medical College; Dr. Brian Levine, Colorado Center for Reproductive Medicine; and Dr. Anthony Febles, Phelps Memorial Hospital. Seated, from left: Kalterina Latifi, accepting for Dr. Rifat Latifi, Westchester Medical Center; Dr. AnneBeth Litt, Westchester Institute for Human Development, and Dr. Cynthia Chin, White Plains Hospital Center for Cancer Care. Dr. Ansley Bacon receives Award!